Dubai, UAE, July 16, 2018: Travelling can be a lot of fun especially when you are travelling light. This said, with the extensive beauty routines that most women indulge in today, it can be quite a daunting task to choose the right products to travel with, and not having to change up your beauty regimen. Knowing this, Glambeaute.com has stocked a great selection of travel essentials for women who like to travel light without compromising on their much-needed beauty regimen. 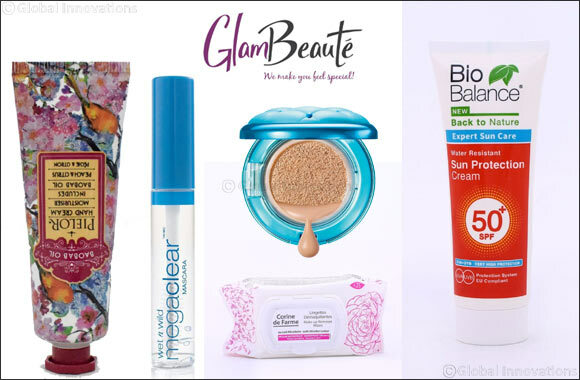 This popular online beauty shop showcases a wide selection of make-up, haircare, skincare, fragrances and accessories brands at amazing prices. Its list of best-selling travel beauty must-haves will ensure that a woman has everything she needs for her summer holiday. Bottles of liquid foundations can crack and spill while travelling. This weightless mineral formula, liquid foundation comes in a cushion compact and travels easily! It provides the multi-tasking benefits of an alphabet cream with the gentle, flawless skin-perfecting effects of minerals. The revolutionary cushion foundation instantly corrects visible imperfections, blurs fine lines and pores with a perfected airbrushed finish. It also has SPF 50 that protects from UVA/UVB rays. This clear mascara is every girl’s must-have! Perfect for accentuating those gorgeous lashes, this mascara features a clear formula that lifts and separates for a defined look! Fortified with soy protein and vitamin E, this non-budging formula helps condition lashes and gives them a basecoat of protection that can be used as a seal to stop color mascara flaking. To top it all off, the clear finish is also great at taming and setting brows in place – a perfect multi-tasker that is idea for traveling! Perfect for travel due to its multi-tasking character and available in 4 fabulous shades, these duo-tints can be utilized for both lips and cheeks. These tints can also create cohesive looks for a natural and dewy finish with one single hue. When you’re on the go, a mini dry shampoo is a must-have! Whether you want to skip washes, make a blowout last longer or want to add volume to your locks, it is an excellent item to have on hand. These dry shampoos from Hask are available in handy size 75ml bottles and act quickly to soak up oil, sweat and odour leaving hair feeling revived, bouncy and clean. No leak concern, these wipes are fast working and have been created with purified extracts of plants and flowers to bring their natural benefits to the skin. Perfect for eyes and face, they remove make-up, tone and hydrate the skin gently and in a single gesture. This ultra-light sun protection formula contains UVA and UVB photostable filters, vitamins and herbal extracts to protect skin against sun damage, sun-induced pigmentation marks and premature wrinkle formation. Ideal for using under-makeup, the formulation is available in a handy 75ml tube and is great for daily use. This cream smells like a holiday in a tube with its tropical scent of peach and citrus. Available in a travel-friendly size of 30ml, it helps to protect you skin from external effects and soften your hands with its light texture and without a sticky residue.